The official position of the Beth Mason universe as she would like it perceived is she is a good citizen who advocates for good government and her campaign reporting issues are resolved as just recently she discovered this 21st century occupation called an accountant. The truth however is entirely different, twisted and the Beth Mason campaign "expenditures" during post election cycles, long after her 2011 council campaign shows a different; actually it's a purely illicit, nefarious picture. If the average person's eyes begin to close, it's understandable when the words "in-kind" contribution shows up on a campaign report. Let's distill this into a more appropriate common day usage. An "in-kind contribution" is a way for citizens to participate in political campaigns by offering goods and services in lieu of cash or check to a candidate. So a citizen might donate some food to a campaign event or beverages or host a dinner, etc. if they want to advocate for a particular political campaign. All good and perfectly appropriate. For example, Beth Mason and Richard Mason contributed thousands of dollars via in-kind contributions to Timmy Occhipinti's 2010 campaign to see her made Council President, him occupy the fourth ward council seat. Did you know Beth Mason spent thousands on "nails, staples and 2x4s for Tim Occhipinti?" How to spend thousands on "staples, 2 x 4s and nails." Let Beth Mason count the ways on "in-kind" expenditures. Okay, that's pure entertainment and what goes for Beth Mason humor: hardy har har. Isn't she hilarious? A literal flood of monies was paid to long time political consultant Barry Brendel and her 2011 council campaign manager Ryan Yacco long after Beth Mason's council campaign. These massive payments in the six figures occur at some odd times as there's not a Hoboken municipal election anywhere in sight. October 2011: $15,000 total to both Brendel and Yacco. July 2012: $40,000 plus to Brendel and Yacco. (39K to Brendel alone). 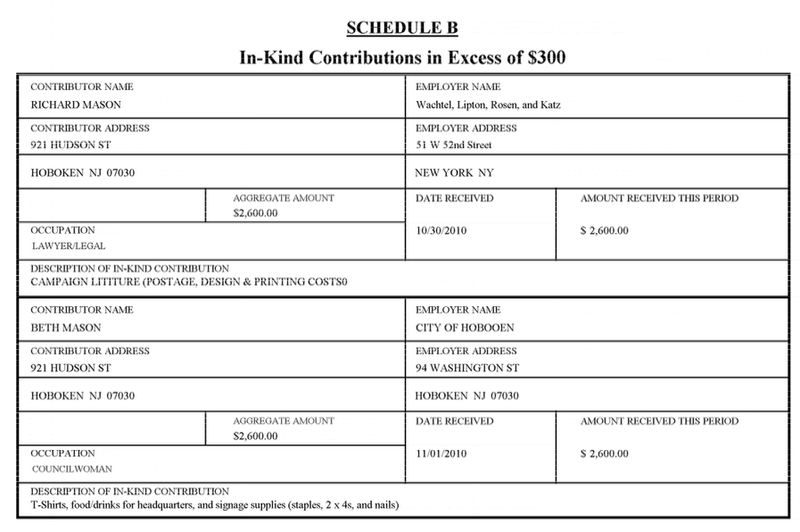 From the chart below, in June 2011 through 2012 Beth Mason is reporting "in-kind" contributions of almost $100,000 ($96,800) to only two political operatives. Mind you, unlike Tim Occhipinti, neither of these political operatives were running for any NJ elected office. They don't qualify to receive any "in kind" political contributions. So what was almost $100,000 being illicitly spent on when no election of any note went on (other than a rambling Move Forward Nazi Truck in the November 2012 Board of Education election)? As anyone could guess, a Nazi Truck, even five trips made to Hoboken as did occur in 2012 wouldn't cost anywhere in the vicinity of $100,000. We're pretty sure a bottom feeding fish outside Hoboken would know. Perhaps he'll explain some day, under oath. What we're looking at here is massive money laundering? These Mason expenditures do not qualify as any sort of in-kind payments. What was Beth Mason blowing a cool $100K on just from June 2011 through 2012? Feel free to let NJ ELEC and related law enforcement authorities know. Everyone, pitch in and lend a hand. The corruption, it's so blatant. Beth Mason's Reported in-Kind Contributions on Her 2011 Municpal ELECs ℅ Grafix Avenger. Talking Ed Note: Beth Mason was not contacted for this story. She wouldn't provide a response to any questions sent to her on this anyway. Maybe if someone knocks on the door with a blue windbreaker.